Cheap motorised two-wheelers have long been ubiquitous in various Asian countries. Now their numbers are surging in Africa too. Taiwan was apparently the pioneer of mass motor scooter ownership and use in the 1970s. 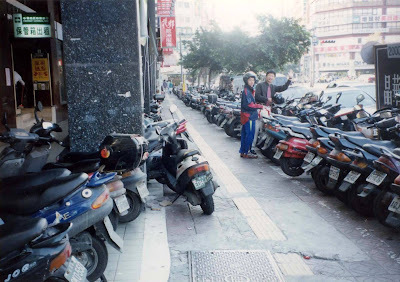 Scooters lined every footway in 1996 when I visited Taipei. Today Vietnam's cities are the undisputed motorcycle capitals of the world. The volume of motorcycle traffic in Vietnamese cities is astounding! Motorcycles are also significant in (among others) Indonesia, Malaysia, Thailand, Cambodia, parts of China, and increasingly India. We have seen in Asia that motorcycles can be both highly problematic and a boon for people who sorely need better mobility. The dilemmas often create ambivalence, which is reflected in the diverse policies seen in Asian cities. Some welcome and accommodate motorcycles (as in Malaysia) while some seek to limit or even ban them (as in some Chinese cities). Vietnam's large cities have recently been trying to limit new registrations of motorcycles, apparently without much effect. Until recently, motorcycles were not a major feature of African cities. Except that is for a few places. These include Africa's motorcycle capitals, Ouagadougou in Burkina Faso and Bamako in Mali, where more than 50% of motorised transport is on motorcycles. For more on this, see this pdf of a World Bank presentation on urban transport in Africa. However, an item last week from Kenya's Business Daily (Kenya: Bikes Rev to Beat Rising Fuel Costs And Traffic Jam) highlights the increasing role of motorcycles in eastern Africa, both as taxis and for personal transport. The boda-boda of Uganda (both on bicycles and on motorcycles) are well known. Now it seems the boda boda business has also been growing in Kenya, especially since a recent crackdown on unroadworthy vehicles created a vacuum in transport supply. Motorcycle ownership by individual households seems also to be rising rapidly. The transport policy 'industry' doesn't seem to have any clear answers on what, if anything, to do about motorised two-wheelers. We are far from any consensus on what policies would be useful. Should we welcome motorcycles? And if so, what policies could maximise the benefits while reducing the harm? I don't know but I wish I did. [POSTSCRIPT: via the Urban Transport News site I see that the "Life of Guangzhou" reports that Africa is the top market of Guangzhou-made motorbikes (6 March 2008) .